Romans, Barbarians, Egyptians, and Japanese have discovered new lands, with new resources and opportunities. You�ll assume the role of leader in one of these factions. In a rush to expand your empire, you�ll build new buildings, gather resources in mines and fields, and build barracks to train soldiers. With all this development, it soon becomes clear that this land is too small for everybody. War breaks out, and you�ll raze and pillage your opponents� settlements. 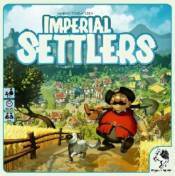 Imperial Settlers is based on concepts from the author Ignacy Trzewiczek�s card game 51st State. The game is played over five rounds in which players will explore new lands, build buildings, trade resources, conquer enemies, and score victory points.